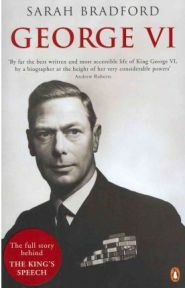 Sarah Bradford’s biography of George VI deals with a king who faced a great deal of adversity in his short reign. The second son of George V, he ascended to the throne on the abdication of his older brother, Edward VIII, who chose marriage to Wallis Simpson over remaining as king. George VI not only had to deal with the upheaval and upset of the abdication and its aftermath, but he saw his country through the Second World War, the strain of which affected his health, leading to his death at only 56. Known as Prince Albert prior to acceding to the throne, he was Duke of York and married Elizabeth Bowes-Lyon, better known to most of us as Queen Elizabeth the Queen Mother, as she became on his death. They had two daughters, Elizabeth and Margaret, and valued their family life highly. As Duke of York, he famously had therapy for a stammer which had plagued him since childhood, whose success enabled him to make his inspirational wartime broadcasts. Alongside Winston Churchill, the King and Queen were seen as symbols of British hope in the dark days of the war, with both determined to stand by the people regardless of any danger to themselves. George VI’s death in February 1952 led to the accession of his daughter as Queen Elizabeth II, and he was mourned as a great king. Bradford’s biography is a hefty tome, and from the beginning seems like quite an undertaking. Her account of the childhood of Prince Albert and his elder brother, the future Edward VIII, is thorough and necessary to understanding the man he became, but it is not a quick and easy read. It is a truly in depth royal biography, and does not take the light tone that many modern biographers take. Written in the late 1980s, I do not believe it is an official biography, but its tone and style mean it can sit happily on a shelf alongside the official biography of George VI’s wife, Queen Elizabeth (her official biographer being William Shawcross). It is, however, compelling reading, telling the story as it does of a man who overcame personal adversity in his stammer to enjoy a happy life with his family, only to find himself propelled onto a throne he did not want, yet became a much-loved and celebrated monarch. Interesting as it is in the early stages of Prince Albert’s life, it is when the abdication crisis approaches that the book becomes truly unputdownable. Bradford maintains an authoritative and dignified style, leaving out no details while also managing to set an exciting pace and thoroughly grab the reader’s attention. There is no doubt where Bradford’s sympathies lie in dealing with the matter of the abdication and Edward VIII, or the Duke of Windsor as he became on giving up the throne. She is completely on the side of the royal family, clearly seeing Edward VIII as stubborn, unrealistic and a poor monarch. She does mention Wallis’s last gasp efforts to convince him to stay on the throne but otherwise you get the feeling that Bradford would happily refer to Wallis as “that woman”, as the Queen did following the abdication. While I have no issue with this view, it may bother others who would prefer a more unbiased approach. George VI is painted as a real person, an approachable monarch who had genuine concern and affection for his subjects in Britain and the Empire. There are numerous quotes of amusing, affectionate and friendly remarks he made, and anecdotes demonstrating his kindliness towards others. One quote which I have read previously and which still makes me smile, was on Coronation Day in 1937 – crowds outside the palace were shouting “We want the king and queen!”, asking for the newly crowned couple to appear on the balcony. The king muttered quietly in response “The king wants his dinner!” but reappeared on the balcony nonetheless. The final chapter, Walking with Death, takes us to the inevitable end of the king’s story. It makes for sad and touching reading, and it is at this point that I realised what a great king he was, and how much affection Bradford’s book had stirred in me. Of course hoping for a different ending is pointless, but I had a lump in my throat reading of his death. I have only two criticisms of an otherwise superb book. Firstly, the photo sections are printed on normal page paper, not the usual shiny photo paper. There have been others books in which I have appreciated this, but in this case I would have preferred the photos to be on proper photo paper, as these old photos are not great quality to begin with, and printing them on normal paper does not help their clarity. The second criticism is the occasional tendency of the author to refer to the king and queen as the “King of England” or the “Queen of England”. It has been 400 years since there was a king or queen “of England” – these monarchs should be referred to as King and Queen of Great Britain. However, these are fairly minor criticisms in the face of what is an outstanding biography of a great king. Bradford has an excellent authoritative style without being dry, and successfully brings her subject to life. I thoroughly enjoyed reading George VI, and would highly recommend it to anyone with an interest in modern history. No Comments on "George VI"